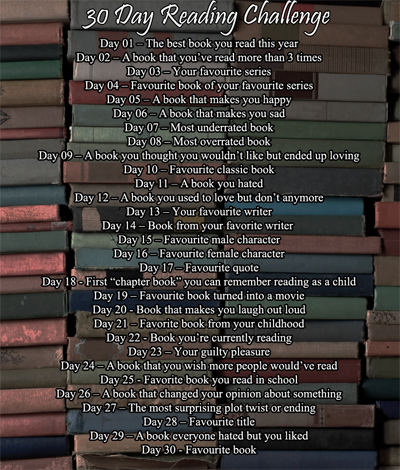 The first book that came to mind is one I already mentioned as one of the best books I’ve read this year so as to not reuse answers, I had to think of another one! To be honest, if I don’t think I will like a book, I usually don’t even bother picking it up. When people recommend stuff to me, I give things a try, though. I guess I would have to say the Harry Potter series for something I thought I wouldn’t like. I had no interest in reading them originally because at the time they came out, I was younger and going to church and there was the big thing with the books being evil. I was still young enough that I didn’t really question it much and I figured that if these people are saying that these books are evil, there must be a reason. At the same time, I was really curious to see what about them was such a problem and I found myself wondering if the people saying this stuff have read them…then what’s wrong with me or others reading them to see what IS wrong with them. One of my best friends at the time was married to a guy who had all the books and we had similar book tastes so he offered to let me borrow the books and I thought, why not? If someone is a strong enough Christian, they should be able to read stuff not in accordance to what they may feel and be able to walk away without it changing them. So I read and I fell in love with the series….and I found absolutely nothing wrong with them. A lot of things that were said weren’t even valid and I wonder if the ones stating that stuff had even actually read them! I think the fact that J.K. Rowling is a proclaimed atheist might have had something to do with all the conspiracies. Yea, there’s magic and spells but those are also in Disney movies and I can tell reality from make believe. So…I didn’t think I would like them, but I grew to love them AND I also grew an obsession with wanting to read things that are banned because of all this. I don’t appreciate others reading material and then making the choices FOR me as to whether I should be allowed to read it or not. That’s not your choice, I’m an adult, I can decide for myself, thank you very much!